Ms. Lineo Ramataboe came to South Africa in 1999 after a brief stint in London United Kingdom. She studied accounting at the University of Lesotho and continued her studies in England. She obtained a Higher National Diploma in software engineering in Oxford Brooks University and an honours degree in Computer Science at Essex university. She worked as a Clinical Audit manager in London for two years while training young unemployed youth basic computer literacy to give them work readiness skills. Her passion for Education and Training brought her to South Africa where she got a contract training computer literacy for young women executives studying with Warrick University to take up placements in Eskom. She then worked for the South African Qualification Authority managing the development of NQF qualifications for Mathematical, Physical Computer and Life Sciences fields. Her love of all things Education took her to the National Business Initiative where she was part of the Joint Initiative for Priority Skills Acquisition (JIPSA), and in 2010 to the Human Resource Development Council where she is currently part of the management of the Secretariat. Lineo is responsible for administration, coordination and communication in the Secretariat. 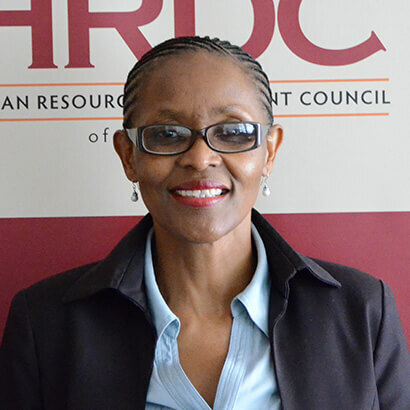 She makes sure that engagement with Council members and HRDC stakeholders is seemless and effective.